Yesterday, french telcos Orange and SFR announced their co-investment on two suburban towns in the "Greater Paris" (french joke) area, to roll-out FTTH Fiber-To-The-Home. They also announced the possible creation of an open joint-venture that would serve as operators' s operator for medium dense areas. Of course, this is a smart move, considering the Fiber-Broadband plan to be unveiled by the government on Monday the 18th of January. No need to sport an MBA to understand that France Telecom and SFR have set up a nice trick to get public funding in order to build their own next-gen access networks. Now, it may be useful to get back a few months ago, and read this post and this one written by Jean-Michel Soulier, CEO of french-canadian operators' operator Covage. Here's what Jean-Michel proposed before the whole attendance at the yearly forum held by Regulator ARCEP last September. - the territory could be split in 4-5 segments representing approximately 1m households each in semi-dense areas (this assumes that private initiative will cover dense areas, which according to operator Free is easier said than done). - a national consortium would be set up with the largest operators and the French national bank CDC. The consortium would in turn establish a subsidiary in each of the territorial segments. - In each segment, a neutral operator would be selected for the deployment and operation of the FTTH network, in association with the local communities willing to participate in exchange for some ownership in the network. - the large operators, as members of the national consortium, would commit to use the consortium's FTTH lines in order to guaranty the business case and the ability to raise additional financing. That is a simple plan, quite easy to implement, and above all: it ensures Open Neutral Access. Which Orange-SFR public-money-vacuum-cleaner new venture surely won't. At the Broadband World Forum Europe, which opened its doors yesterday in Paris, a small Canadian firm is making the buzz. Genesis (what a cool name ;-) Technical Systems (slightly less appealing ;-), aka GenesisTechSys, is unveiling its Bonded DSL Rings™ (BDR) solution. A patent-pending access technology, BDR re-uses the existing copper plant to deliver up to 400Mbps of bandwidth. As Stephen Cooke, President & CTO, describes it, BDR uses each house as an regenerator for the next connected one. So to speak, as with Skype: more users means more bandwidth available for the community. According to Stephen, Bonded DSL Rings™ is to leave the labs early next year, for the first field trials by mid-2010. For the time being, the only data at our disposal is available on GenesisTechSys website, with the FAQs here. Anyhow, this announcement should ring two bells in a Telecoms veteran' s mind (like me, got it ? ;-). First, BDR proves once again that Copper is not dead, although Fiber is going further each day everywhere around the Planet. Copper-based access networks are here for the next 20 years, thanks to some big surprises coming from newcomers like Genesis. Which means a total investment by each and every citizen of the Pau Greater Area of 143.00 EUR over 15 years. post-scriptum: The PBC Pau Broadband Country is the mother of all Muni FTTH network on the planet. Everyone interested or involved in this topic should study PBC carefully, and in depth. Learnings are just amazingly surprising. Positively surprising. I've been quite silent here over the last months, although I've been quite active on the FTTH front: training an installation & maintenance contractor, visiting key vendors, working on Muni Broadband projects, attending seminars and conferences. Installing fiber at the FTTH subscriber' s place is not a B2B job. It's B2C. We are the Consumer. You don't behave the same way when dealing with me aka the person than when dealing with me aka the enterprise. This is where everybody fails, from the Telco to the Contractor: the traditional "telecoms" technicians are not suited for installing fiber in our houses. They may have all the required technical skills, but they lack the social ones: customer relationships. Here in France, some big players recently realized the issue, due to the countless problems they have to face once entering the Subscriber's place. My take: in two years from now, the guy (or the girl) who will install FTTH in my house won't come from the Telecoms world: she will come from the Retail world. 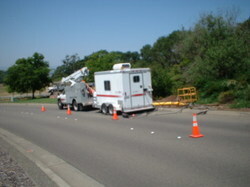 The future of FTTH relies into Muni Networks. Telcos and CableTV operators have only one objective: make their company's stocks shine on the market. Therefore, no private Communications Services Provider will deliver non-TriplePlay services on their own networks, at least not until some new player comes with a disruptive business model à la Apple' s App Store. Just because they can't make money selling the peer-to-peer/local/kiosk services that are the true juice of Fiber-To-The-Home. Let's face it: only Open Neutral Access network infrastructures allow the so-called Next Generation Applications or Services, such as Tele-Medicine. Applications which must be operated by some Service(s) Provider(s) who are of a totally different type than the Telco and the CableTV guys. One must split the services from the infrastructure, to enable competition and service delivery. Allowing anyone to provide any service to anyone on the network is the key for innovation, hence jobs creation. Ever heard of a private telco with such an open mind ? Hence this fact: a) as existing Telecoms and CableTV operators will only deploy FTTH in dense urban areas, b) as Collectivities, e.g. City Councils, in the rest of the country, e.g. rural areas, will have to go Fiber Broadband in order to avoid the Digital Divide and keep their employment rate up, c) as those Collectivities will build public infrastructures which are open and neutral by nature, FTTH Muni networks will serve as the platform for innovation, new businesses and new jobs creations - like the Pau Greater Area do with its Pau Broadband Country network, by the way: more than 600 new jobs since 2005, for a 140,000 inhabitants area, with 50,000 households passed and 10,000 active subscribers to date, for a total investment by each and every citizen of 143.00 EUR over 15 years (or less than 10 euros per year over 15 years...). 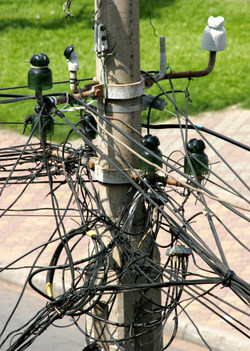 There is not one business model for FTTH but two: Pau, and Twitter. Regarding Pau, see above: 10 euros per habitant per year over 15 years, to build and operate a FTTH/FTTB network with the highest penetration ratio in Europe to date, and hosting some of the most advanced high-tech research centers in the World. Now, think Twitter. A disruptive Web 2.0 service, launched 3 years ago without any business model, today the fastest growing communication tool on Earth. Still no proven, established business model, yet millions of users, daily. Hence this: get Munis and Collectivities to build open neutral 100 Mbps symmetrical access networks, and let the people create the killer app. Forget ARPU, CAPEX, OPEX. Go PEOPLE. French incumbent France Telecom-Orange is entering the age of Smart Moves, thanks to its CEO Didier Lombard. See this announcement. Remember the late 90s ? France Telecom was leading the Global One consortium. Now they're going global, as one. Thanks to Jean-Michel Planche for the heads-up. You can follow Jean-Michel on Twitter here. [updated 10/7/08 4:36PM CET] See this 1Gbit/s trial in Amsterdam ? Imagine the same type of apps (3D-HDTV for instance), right at the size of your district. A true field trial. That's what the Pau Greater Area and its Pau Broadband Country FTTH platform can offer to you Next Gen Apps vendors and to you Heavy Bandwidth Consumers. Buddy Blogger Benoit Felten has published an outstanding interactive map on the actual situation of FTTH Fiber-To-The-Home networks worldwide. Worth the look (and bookmark) for all of us working in the FTTx field. "About Pau : the 6,000 active subscribers milestone will be achieved within the next couple of weeks. Based on the map, which is pretty accurate thanks to Benoit's outstanding work, one can note that Pau is the ONLY european city south of the Loire river (means, where weather conditions are wonderful for most of us ;-) that offers up to 100Mbps connectivity to enterprise & residential customers." Go to the map here.
" Looking for IPTV? Then move to France. " This article, by Ray Le Maistre, International News Editor at the mandatory Light Reading, demonstrates once again that my country (France. You know, the little old piece of european land ruled by a superb showman) is truly leading the Telecoms World. But nobody here knows it, including our Emperor, ooops sorry, er. President, unfortunately. Digging the Web for data on FTTx Fiber-To-The-Something key players in the Bay Area, I found this 125+ pages document. Quite an extensive overview of the FTTx markets, although the study is dated 2003. Considering that the Telecoms industry just recovered by the end of 2006, IMHO most of the informations you'll find in there are still pretty much relevant - simply change names when M&A apply.